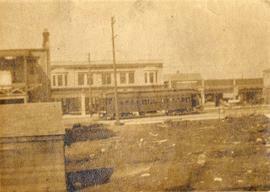 Sepia image of the interurban tram on Commercial Drive between 1st and 2nd avenues. B&W print depicts a car with the license plate 18873. "Keefer St." is written at the bottom of the image.Note: colour adjusted on jpg. 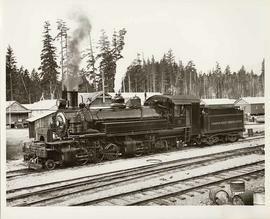 Photograph depicts the Vancouver express train.Train labeled "1104" in centre of image facing right; grassy area in foreground.